March 2017 issue on sale now! | What Hi-Fi? March 2017 issue on sale now! 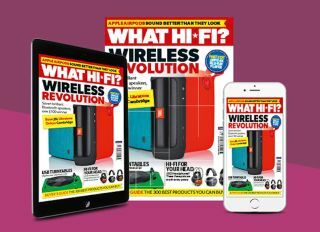 A smorgasbord of wireless speakers, first tests of Apple AirPods and 4K Blu-ray players, and a head-to-head of high-end headphones; the new issue of What Hi-Fi? is available now. It's time to shake off those winter blues and welcome in the warmer weather. The March issue of What Hi-Fi? is on sale now, and if you're planning on taking your hi-fi outside this summer then you won't want to miss this one. We put a range of seven Bluetooth speakers through their paces - including Bose, Cambridge, Libratone, Philips, Onkyo, Kitsound and JBL. Whether you're looking for something for inside or outside the house, our test will have you covered. You can subscribe or buy the latest issue here, or buy the digital edition on iPhone, iPad or Android devices. We can't get enough of the vinyl resurgence, but the turntables of the past don't quite cut it these days. If you want to mix the best of both the vinyl and streaming worlds, a USB turntable is certainly a good place to start looking. No matter how much you're spending on a pair of cans, you're want the best value for money - especially when your price point starts going over £500. We have three products that are vying for your attention, from Audio Technica, Beyerdynamic and Fostex. All three are comfortable, well-built and lightweight, but it's sound quality that really matters - and in this issue, we'll let you know which over-ear headphones we'd recommend. As Notorious B.I.G once said, "Mo Money Mo Problems" - however, when it comes to our high-end Temptations this issue, we have to disagree. Pushing the limits of your wallet is the Leema Tucana II Anniversary Edition stereo amplifier, which will set you back £5000. Celebrating the speaker manufacturer's 10-year anniversary, this amp is a definite symbol of how far hi-fi has come. Also featuring in this month's Temptation pages are the Venere S stereo speakers. Produced by Italian hi-fi manufacturer Sonus Faber, these speakers offer a sound quality that we think is worth the £4800 price. As always, we have an array of First Tests to guide your hi-fi purchases. There's a vintage-style radio from ViewQuest, a pair of Roth speakers with an in-built phono stage, as well as the controversial Apple AirPods. From audio to video, we've tested a 4K Blu-ray player from Oppo, a uniquely-designed Philips television that sits on a cheese-grater style speaker and the new Google Chromecast Ultra. If you want to keep up to date in the hi-fi world, there's no magazine better than this. Happy reading!